With 12 million of us visiting the land of sun, sea and sangria each year, it’s hard to imagine there being a quiet spot to catch some rays. 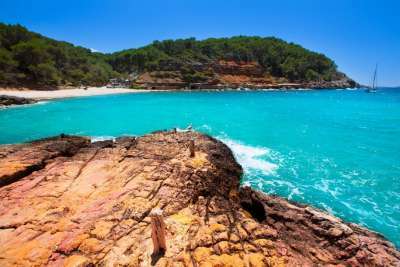 But before you write off all Spain’s beaches as being jam-packed with fellow pasty Brits bickering over sun loungers, take a look at these secret Spanish beaches – ssshhh don’t tell ’em we told you! Who'd have thought this little slice of serenity is just a 15-minute drive from San Antonio? Escape the 24-hour debauchery of Ibiza's biggest resort and head to this rustic little beach, kept hidden by its surrounding pine forest. 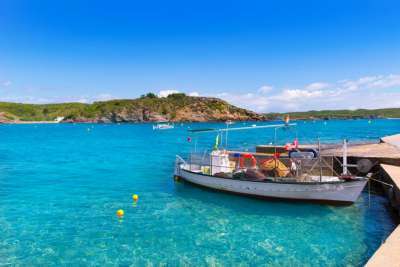 Cala Salada is particularly great for snorkelling and cliff jumping (if you're brave enough) and there are some fascinating caves nearby with well-preserved Bronze Age paintings. Es Grau has managed to remain unspoiled due to its location within S'Albufera des Grau Nature Reserve - an area that is protected from over-development. Wade out into its shallow, light blue waters, that only start to get above shin height after 40 metres or so, and take in the peace and quiet. You can enjoy views of the surrounding scenery of the reserve, Es Grau village's white-washed houses and the colourful boats bobbing along in the calm waters. Sitting below the peak of Puig Major, the Balearic's highest mountain, this shingle beach on Majorca's north-west coast is as secluded as they come. You'll need to hire a car to reach here and although there are no other facilities, there is a nearby restaurant serving up traditional Spanish dishes. Although it can get pretty lively in the summer evenings, by day you'll only share this beach's golden sands with locals and surfers making the most of the Atlantic's impressive waves. 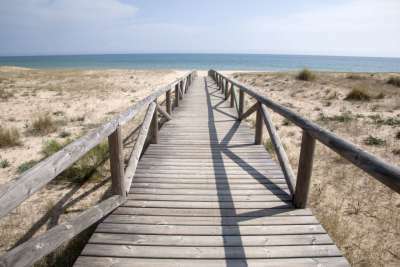 El Palmar is located along the coast from Cadiz, and is a more relaxed alternative to other beaches in the Costa de la Luz. 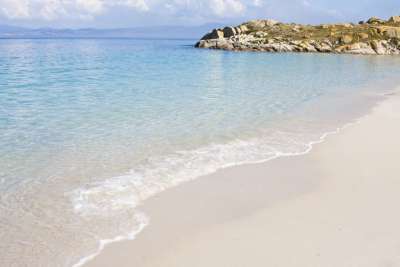 A short boat ride from the coastal city of Vigo lies an archipelago of islands nicknamed the Galician Seychelles due to their pristine white sands and clear waters. You'll need to reserve your trip here in advance as they only let a certain amount of people per day onto the islands. There are many beaches to explore and a nature reserve, but be aware some areas such as Figueiras Beach are nudist hotspots! Aptly named, Playa de Silencio sits in a silent cove, surrounded by dramatic, rugged rocks. 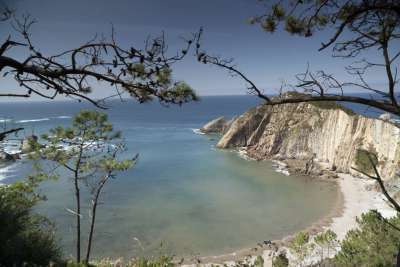 Its calm, sheltered waters can be reached via a twisting pathway and steps from the quaint fishing village of Cudillero. 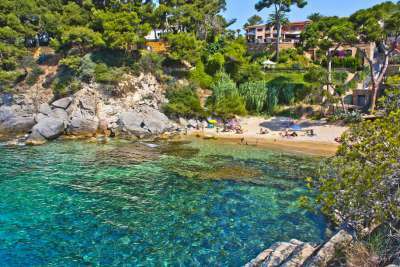 The turquoise waters of Platja d'Aro can be enjoyed in this hidden cove surrounded by green leafy trees and rocks. This little strip of golden sand is just 65 metres long so get there early to secure your spot as it is still popular with those in the know! Ok, this beach isn't a huge secret, having been featured in films such as Indiana Jones and the Last Crusade. 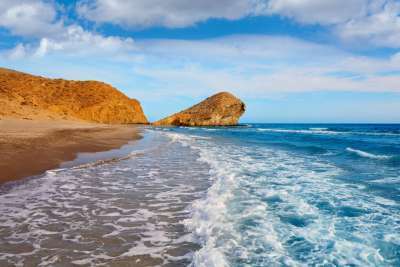 But it has managed to remain largely unspoiled due to its location in Cabo de Gata National Park. The beach is framed by imposing volcanic rock formations that look almost like abstract sculptures. Coupled with its orangey-golden sands, it's as dazzling as they come. 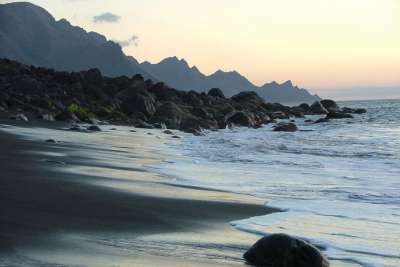 Las Teresitas beach is a little bit of a gem on Tenerife's busy coastline. Although it still draws in crowds, especially on the weekends. It does manage to escape the sheer levels of congestion that the southern beaches have, due to its location away from the major tourist hubs. Its sands were imported from the Sahara, so it is also one of the few beaches in northern Tenerife to have yellow rather than black sand. 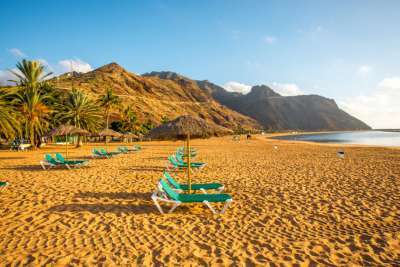 The combination of a tricky journey and lack of golden sand may put some tourists off visiting this secluded beach on Gran Canaria's northern coast. But those who brave the drive will discover an almost deserted beach, where stone and grey sands leave the waters crystal clear - superb conditions for snorkelling.